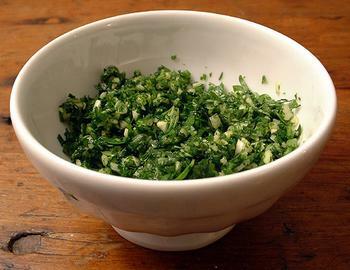 Parsley and garlic are essential components in so many recipes. When the two are finely chopped together, they become persillade, a powerful mixture that brings enormous flavor to a dish when added just at the very end of the cooking process. Persillade is the key flavor agent in the classic bistro side dish Pommes Persillade (Potatoes with Parsley and Garlic), which I first learned to make many years ago watching Jacques Pépin's old television series Today's Gourmet. The potatoes are featured in Jacques Pépin’s Table, a collection of recipes from Today’s Gourmet (the recipe can be found through an Amazon "search inside the book"). The recipe calls for cutting two peeled russet potatoes into small cubes and sautéing them over high heat until they are browned and crisp on all sides, yet soft in the center. Because the potatoes are cooked in only two tablespoons of oil (I used olive oil instead of the canola oil in the recipe), they are relatively light. 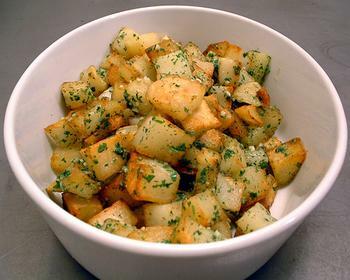 The minced parsley/garlic mixture, almost resembling a paste, is added to the potatoes, along with salt and pepper, just at the end of the cooking process so that the dish retains the freshness of the parsley, yet the tiny pieces of garlic cook just enough (without browning) to take away the rough edge that garlic has in its raw state. There would seem to be endless improvisations on the basic persillade, from the addition of lemon zest or anchovies to varying the herbs, substituting tarragon or thyme, for example, for parsley. I got to thinking about this idea and experimented by combining the traditional persillade with lemon zest and chile flakes. 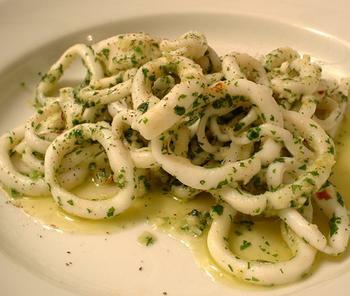 I quickly sautéed calamari over high heat and then added the modified persillade to the pan, with salt and pepper, cooking everything together briefly before finally adding a squeeze of lemon and serving. The result was a success, bright and sharp from the parsley and garlic, with the tangy flavor of lemon and just a hint of heat from the chile flakes. POTENT PERSILLADE Classic Pommes Persillade (below) and an improvisation, Calamari with Parsley, Garlic, Lemon, and Chile (bottom). The picture of Pommes Persillade looks so good, I will have to try the recipe this weekend. Thank you for always making me hungry. Thanks, Joe. The potatoes and the picture came out pretty well. They're very easy to make, so I encourage you to give them a try. wow! the pommes persillade look absolutely fabulicious! I can almost taste them. didn't realize they could be so easy - will be trying them out soon. Thanks, Renee. The potatoes are really very simple, but still very tasty. Sorry, the recipe and the food look great, but I couldn't stop worrying about your coffee the next morning! It's shaped like a latte bowl, but it's actually tiny. You can fit the little bowl in your hand. The picture gives no sense of scale! Two great ingredients that taste great together. We are Agroproducts exporter from India. Many others include bread crumbs, oil, vinegar in the recipe? Yours is a classic, simple approach and a good, clear description, Kudos! I enjoy your perspective! I am a confirmed believer that once you have the basic, the fluff gets easy! Blog On! I agree with your last post - keep the persillade simple. This evening I cooked (for my "crew" of 48 years and me) marinated mackerel fillets on a bed of persillade of marrowfat peas, served with hunks of French bread (and gallons of Aussie Chardonnay). The persillade was chopped parsley and crushed garlic very lightly sautee'd in butter (melted into a little gently heated olive oil to stop the butter burning). The canned marrowfat peas were heated in a saucepan for three minutes and drained. Mix in the persillade and plate up. In parallel, gently fry in olive oil the mackerel fillets - bought from Tesco's, ready marinated in chile, ginger and lime - for two minutes each side and scrape away the skin before cutting into two inch sections and serving onto the peas persillade. A modest sized portion is very filling, and healthy, no need to add salt or any other condiments. thanks admin for sharing this cool thing with us. It’s a pleasure to visit this blog because it has a detailed structure.